As a series 1.5 2+2 FHC owner I also struggle to value my car for insurance purposes. I try to keep an eye on values but its very difficult. You certainly can't go by prices advertised - how many of us paid the price our car was advertised for? Advertised prices most frequently are,shall we say at best ambitious, at worst deluded? With regard to identifying a S 1.5, from my observations its more complicated. The spec I've seen in this chain is certainly true for cars sold in the US, but for UK series 1.5 cars.............. open headlights - yes, twin cooling fans - no, ribbed cam covers - no and toggle dash switches not rockers. Also obviously thriple SUs not twin Strombergs. No doubt there are many other differences between the US spec and UK spec series 1.5 cars, these are just what I've consistently spotted. As stated here, prices are all over the place. 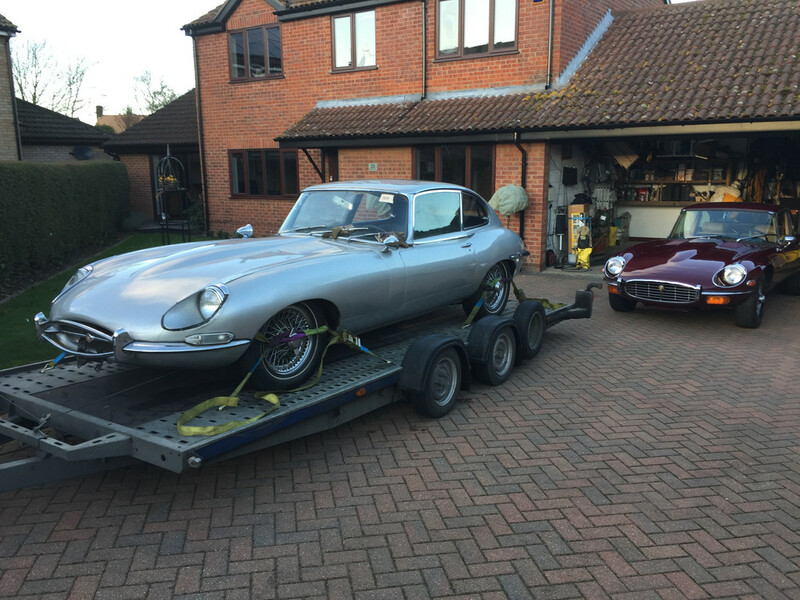 I suppose that is partly due to the fact that there are many variants of E Type for sale, from flat floor Roadster to automatic Series 3 2+2. I'm told by one dealer recently, rather rudely, that E Type values have 'gone down the toilet'. Whereas I don't 100% agree with him, they do seem to have dropped back a bit lately. 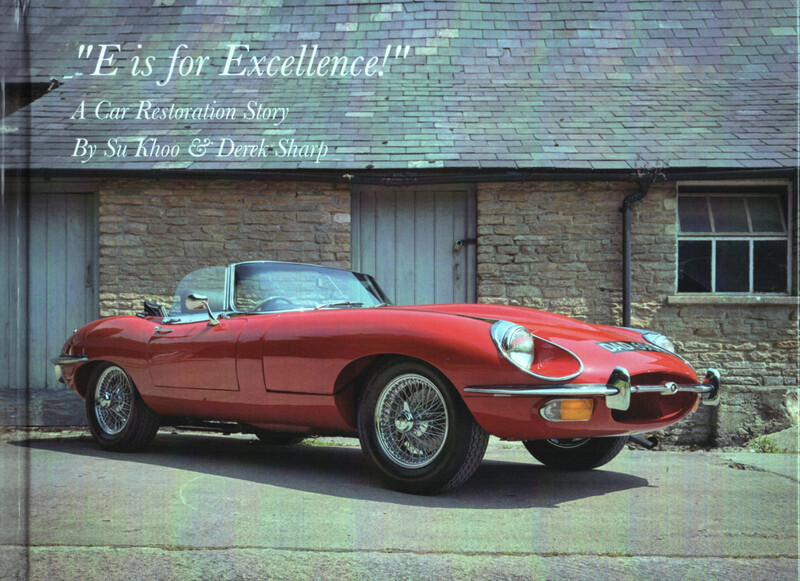 What valuation would learned owners put on a mint, nut & bolt 2018 full professional total restoration of a signal red Series 2 Roadster, matching numbers, heritage certificate, RHD? 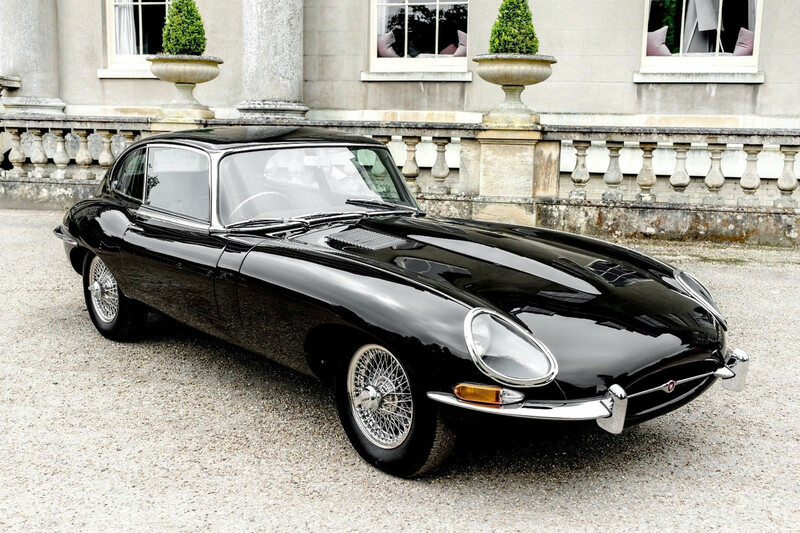 The biggest variable in E-Type prices is the premium that some retailers command on their cars. Eagle E-Types for example, command stratospheric prices. So what is a good price for private sale for a series 2 roadster in concours condition, rebuilt 100 miles ago? I bet the answers range from £80K to £195K. I don't include those Eagle prices. I suppose at the end of the day it is down to what someone will pay, so that means don't start low. Last edited by dereksharpuk on Mon Aug 13, 2018 11:01 am, edited 1 time in total. I have a S1.5 2+2 daily driver - solid but slightly scruffy but new interior and 5 speed box conversion. I've based my value, as another contributor suggested, on what I think it would cost me to replace in the similar condition - I estimate c£40k. Series 1.5 cars - to throw a spanner in the works - I note there is a big differences between UK and export S1.5 cars. UK cars continued with single fan and toggle switches and smooth cam covers whereas export S1.5 had twin fans and rocker switches and many had ribbed cam covers. Just an observation. On a separate note, does anyone have external contact details for MarekH - looking to see if I can source some S1 reversing light LED inserts he mentioned (and appeared to be supplying) in posts last year (2017). I've sent him a Q via the internal messaging on this forum, but no response as yet? Hi Steve, I have now edited my original post with a picture of the 100 page hardback book written about the restoration. More pics are on PistonHeads. This car has been for sale before. 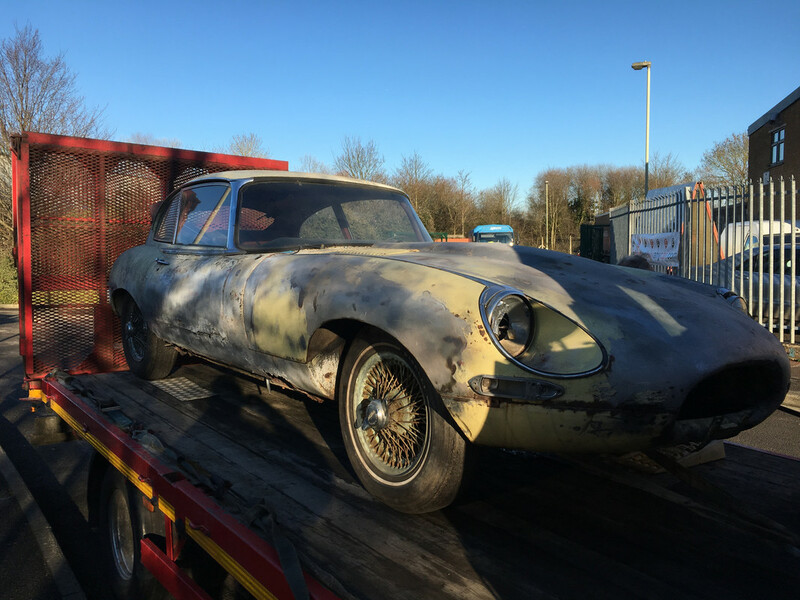 I don’t think it will sell to anyone who knows E-Types. Not at twice the value of a properly concours car (ie an original U.K. car with no modifications and a full history folder). I thought I’d check the video of the engine being tested as mentioned in the description. No dice. Hmmmm! I wish the seller good luck and hope the buyer doesn’t hope to resell any time soon. I’m sure they’ll feel sick if they do. I agree with Chris re correct nomenclature etc. There is such a wealth of information out there that I am still surprised that owners do not know the difference between the various models! Regarding value: obviously a LHD car is worth less than a RHD in the UK. Different if being sold in a LHD market. It would be interesting to know if the carbs. were a retro fit or original. I have seen some LHD none USA spec. cars on triple SUs. In my view £50k value if the paperwork is all there and correct. Not a lot about at the moment! Yes, there's not much about. Tracking the auction houses, I found only 6 were sold this year so far (2 UK, 3 US and 1 AUT) versus 9 last year (5 UK, 4 US). Prices this year have been in a range £29-42K with a median of £36k. That said, these were not pristine examples. Brucey's comment about LHD/RHD intrigued me so I ran the numbers through the database. Of the 40 S1 2+2 auction sales I have since 2012, the LHD prices in the UK run on average at about 11% less than the RHD examples. I sold my series 1 2+2 last autumn via car and classic. Placed the advert at 7pm and had to turn the phone off at 10pm. Had a number of viewings but sold to the first guy at the asking price of mid 40s. The car was excellent bodily and even more so mechanically. A genuine RHD car. Possibly needed repainting - Which the new owner did but otherwise nothing needed. Structurally very good. Maybe I could have asked for more but needed the funds to move to my OTS purchase. I bought 2 LHD 2+2s last year from US on Ebay. It was a whole new experience importing for me. I bought a 73 V12 auto numbers matching and a 66 S1 manual numbers matching. Both were original cars with absolutely no corrosion and original floors sills etc. The S1 had a colour change in the past and had suffered a few dents during its long term storage. The V12 I restored to roadworthy within 4 months and i am still restoring the S1 (more mechanical work on this one). I did find evidence of rear quarter repair on the S1which was a disappointment, but not unusual I think. Of note however, is that the chrome surrounds for the lights are different to the S2. They are shorter. Anyway, it is my intention to reinstall covered during the restoration process. Unless you are fortunate enough to have spoken with the original owner, there appears to be no way to find out which bonnet the later S1 should have from official records. Its certainly not on the heritage certificate. Clausager's Factory Original book says that for the USA and Canada markets the change to open headlights was from chassis 1E77010 for S1 2+2s and this was from Jan 67. Very simple, what you bought is an early S1.5 which is sometimes called an S1.25. Same with my car - S1 car but S 1.5 bonnet. Believe me, your bonnet was made as an S1 bonnet, but they used a hacksaw in the factory to cut out the lip you need for S1 glasses, and put a thin chrome strip on the cut. You can weld on a set of lips which Chuck at MM does sell - plus the inner parts like different diaphragm panels for the lamps - it will be costly, say a grand, but then you can convert it to an S 1 bonnet. I did exactly that, but if needed, I‘d prefer not to hacksaw this thread, lets open a new one on that specific topic if you want (I ran a thread on it, maybe search and read ?). However, in my case it became clear that my bonnet did not belong to my car I think. It had an accident, and PO in the past swapped the bonnet, but used an S1.5 bonnet, for unknown reasons. But as he also used gluey tinfoil plus bondo to repair the sills and painted all the interior with a black rattle can, what should I say. ...He writes „66 S1“ and just below you see a Clausager quote saying „from January 67“ and this brought me to my conclusion. Lets wait for the chassis ID. It strikes me there are so many differences. My car is 1E75791 (original on this post) so falls just before the catagory of having factory fitted open headlights. However when I imported it I recall it also had, toggle dash, polished camcovers BUT a series 2 rad with twin fan. Odd, but I understand cars around that build were a bit mix and match.